Find a spot and green it up. The strategy seems straight forward enough. Check out the whole movement behind Guerrilla Gardening. Instead of spray cans in hand these gardeners have trowels and watering cans. They create code names, plan night time attacks on neglected flower beds, and exchange tips on how to garden successfully. 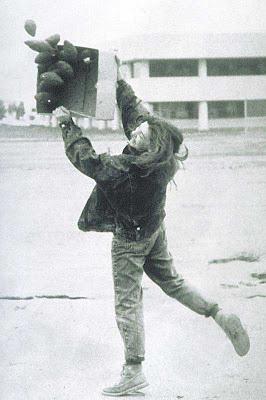 Also worth a look is Green Guerilla , the organization that originally coined the term guerrilla gardening. They are based in NYC and specifically focus on educating the local community, encouraging the growth of community gardens, and involving youth. 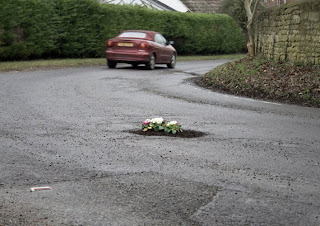 What has caught my eye are Pothole Gardens, a public installation by Pete Dungy. What an innovative way to bring instant awareness to pavement problems! Greenmusuem.org is an online museum that supports environmental artists. The museum has been able to use the art work as a tool for environmental education. I am a huge fan of Kathryn Miller's photography, found at greenmusuem.org. Kathryn hand sculpted 'seed bombs' that were comprised of soil and native seeds. Pete Dungy is awesome! Look at those plants surviving so far! 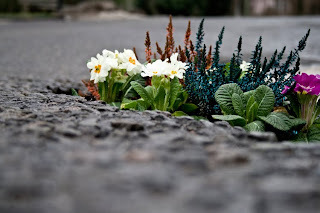 Pot hole gardening - fantastic idea, we could have a green highway around here if I had enough guts to run onto it!